Building Hurts After A Kick In The Ribs! I’ve worked with horses most of my life, so know my way safely around them, at least you’d think! But even though I KNEW Gaia has a potential of kicking (she’s not the most gentle soul), and I thought I was being careful, she smacked me a good one yesterday ~ she, I found out, is flexible, and has terrific aim. I’m pretty sure I yelped comically as I flew (!) backwards into the mud. I’m so very, very glad I had the heavy loft beams already up before this happened! I’m fine, just bruised, no ribs broken. I’ve been working hard on Oliver’s Nest, as the weather has been outright beautiful and staying busy keeps me positive instead of sad. As of tonight, all of the framing in the lower portion is complete, including the framing of both doors (finally! 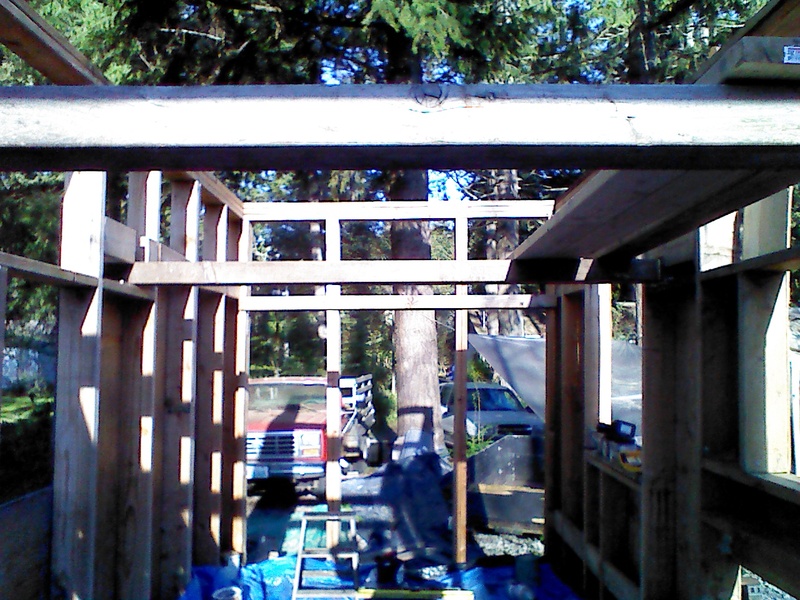 ), and as I already mentioned, the loft support beams. Woot! Also, as I was able to use some 4x6s from the old barn for the loft support as I had hoped, I could place them much further apart than if I’d used 2x4s. I want an open look to the area under the loft, and having fewer beams will help with that. I’m short at 5’5″, and decided to place the 4x6s at a height of 6 feet, which makes the ceiling between them 6’4″ ~ plenty of head room for me, even in heels! The reward is a lot more head room in the loft. I have learned from living in the truck camper that being able to sit up in bed is REALLY important to me. The ceiling height in the loft will be an amazing 4’4″! I’m thrilled! Next up is buying nice looking 2x6s in 14 foot lengths for the loft floor. I don’t want to build the pony walls while clinging to framing – I want a good solid floor to stand on while up that high. It’s not that I’m afraid of heights, or even of falling – it’s just a lot harder to work with power tools safely when doing a monkey impersonation. There’s one particular lumber yard in town which caters to higher-end contractors. Super nice guys. They have the highest grade of wood available (#1) in the widest variety of width and lengths, and are more than happy to dig through that nice stuff and find the best boards for me. 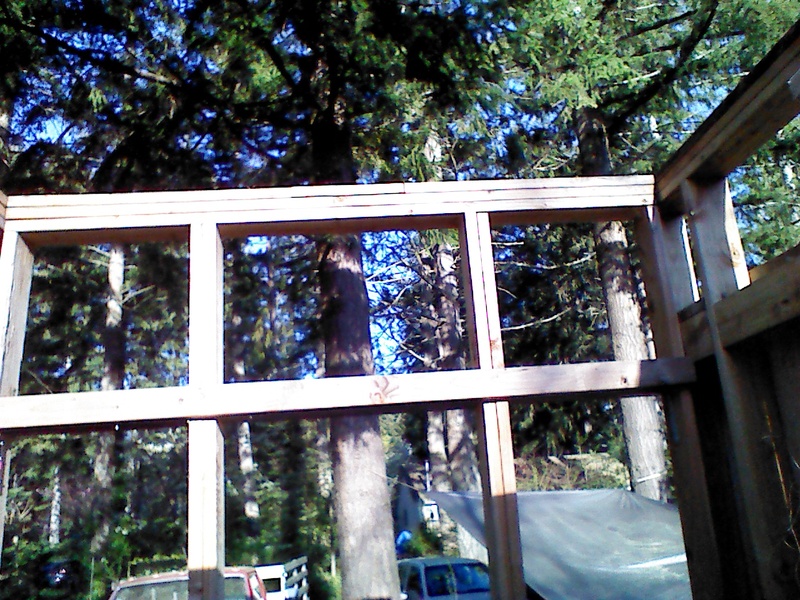 I plan to use them for all visible wood in my little home, and for my roof trusses, too. The snow load is so heavy where my property is, I don’t want to mess around with iffy wood for the roof support. I’ve shopped at nearly every lumber yard in the greater Olympia area, including the big box stores, and for most applications, any place has acceptable wood. But it’s worth it to spend a little more for great quality wood when you have to look at it every day, and for anything that need to be really strong. It’s kind of funny I suppose, that I’m using such a wide spectrum of materials….reusing old wood, re-purposing all sorts of things including the trailer bed from an old travel trailer, and then going first class on some things. Wool insulation, expensive roofing materials like thick EPDM over the best quality lumber, big new windows….I like how it’s coming together though. If I save money where reasonable (and safe), I can spend more on what matters the most to me. It is such a personal creation, this tiny home of mine. I’m proud of it, and I’m proud of myself. The loft beams! I’m a messy builder, aren’t I? My big red beast of a truck is back there, and a glimpse of the lovely tarp. Look at that blue sky through the trees! One more thing ~ I am loving my new Makita impact drill! It has made the construction process go a lot faster and easier! I highly recommend the 18 volt cordless Makita line. Now that 24 volt tools are showing up, the 18 volt tool prices are dropping and it’s easier to find them for a steal. I’ve got the circular saw, the impact drill, the sawzall, and the battery charger with three batteries. They charge really fast, and having three has kept me from ever having to stop building and wait. I realize I’m sounding like an advertisement for Makita….it’s the only brand I have hands-on experience with. I’m sure most of the 18 volt brands available are just as good. Hurray for cordless tools! Just be sure to buy an extra battery or two ~ it’s well worth the expense. ← To My Most Beloved Oliver. Good advice on the tool front, Makita are top notch as are my favoured DeWalt. The extra battery is a must with as higher ampere hours as you can afford. Progress is looking good, a very solid build. I’ve heard good things about DeWalt, but I don’t think I have any of their stuff, even corded…I’ll have to look. I don’t know if Makita’s batteries come in more than one flavor of ampere hours, but find that I do really need 3 on days I’m using my tools a ton. They recharge really fast, at least.